The Color of the Year 2010…TURQUOISE! But its not the turquoise hue you may be imagining… this one leans heavily toward green. It’s PANTONE©15-5519. 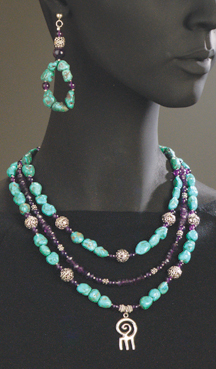 We’ll be exploring this in the Spring/Summer 2010 Color Report for Bead & Jewelry Designers. I’ve already shot some beautiful pieces to represent this beautiful color. Yikes! Turquoise is the color of the year. I hope my color report project will do it justice. Personally, I like this greener version, it evokes images of the tropics. I’ve seen enough of the bluer turquoise to last a lifetime. Great necklace! Is that one of your designs? Yes, I made the necklace.. though its really not a great representation of Pantone’s 15-5519 color…. its not green enough. But it is a fun necklace. the silver focal is from MythMakers. You’re out there in the Southwest so you get to see real turquoise all the time. Others of us are not so blessed. I will never tire of this color! Margie, Welcome back. I really missed your emails. Beautiful creations. Lovely cruise pictures. I have finished makeing or beading your necklace “Dome of the Rock” as I call it. A friend on mine wants me to do the black version of it. I am so interested in your classes: Passion for Color (2 day class) and The Magic of Color. May I please get more info about them. Where and what dates? I like the above torquise necklace. Do you share or sell the technique of doing it alone? Because between my daughter and I we have all the beads used in it. I love my book “Beader’s Color Palette” my next project from it is the green casscade with pink in the middle. That book in our encyclopidia for color, beads, and culturs. A black version of the “Collar of Glass & Light” would be beautiful, especially if you have several different finishes of black dagger beads included. The best way to learn about when and where I teach is to read the newsletters. I am so glad to hear how you like “The BEader’s Color Palette.” Thank you so much, Zainab!